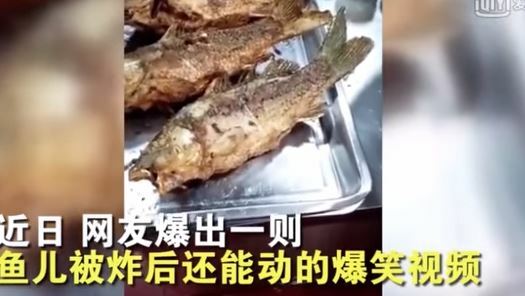 A really weird video of a fried fish twitching on a dinner plate in front of diners is doing the rounds online. The fish appeared to come back to life in Hengyang, Hunan Province in southern China – and the whole thing was caught on camera. Placed next to other fried fish, the video shows the animal twitch slightly before beginning to flail around – at which point a female patron begins to yell. The Independent writes, there’s a woman who can be heard screaming: ‘Oh no, no, no! It’s cracking!’ as the fish begins to jerk around and its flesh opens. The video was originally uploaded to Chinese social media site Weibo, and people are reportedly really creeped out by it. Which is believable. Although the fish looks dead, the video has many people raising concerns about animal abuse, with some believing the fish is suffering. Don’t they think that’s horrifying? Why can’t they kill the fish first before frying it? Give it another five minutes or so, the fish will be cooked. IFL Science explained in a previous post following another – probably more bizarre video – why these things happen. The article says the explanation is a ‘reasonably simple one’ and also a ‘pretty common phenomenon’. Apparently, we also see the same jerking movements from fresh raw frogs’ legs and diced squid – and sometimes in dead humans. So why, without signals sent and received via the brain and nervous system, or a beating heart, does dead tissue continue to move? Although the brain and heart are not functioning, there are cells that can still respond to stimuli, for example, added sodium. Immediately after death, muscle motor neurons (the nerves that create movement within the tissue), which are triggered by electrical signals, still contain some membrane potential (difference in ion concentrations). All cells are polarised, which means that there is a high-to-low gradient of charged atoms, or ions, from inside cells to outside them. The difference between these concentrations is what creates a charge across a membrane. When not being activated by the nervous system, neurons maintain their membrane potential by pumping out a balance of sodium and potassium ions (both needed to instigate neurons firing). However, when the neuron is activated with an electric signal, specific channels within the cell open up, allowing sodium ions to flood in – and as equilibrium of charge in the cell to its environment is required, potassium channels are, as a result, also opened up, causing them to flood out of the cell. Eventually the channels close and the neurons work to restore balance between concentrations of sodium and potassium inside and outside them – but not before triggering nearby channels to open, causing a chain reaction within the muscle. This is basically how neurons create movement within a tissue.